Creator Ryder Carroll describes the Bullet Journal as the analog system for the digital age, and it is exactly that: a quick, simple to use system that requires only a notebook and a pen to help us organize our busy modern lives. Carroll provides a great overview to learn about Bullet Journaling and how to get started here. Many people have expanded on, adapted, and made this system their own; one of my favorites being Boho Berry. It is this the level of personalization that really attracted me to this system. You see, like many women with TS, I struggle at times with executive function and focusing, and I discovered in high school that planning helped me with this. In high school and college student assignment notebooks kept me on task. After college, however, these notebooks no longer worked for me, and typical day planners were boring and restrictive. The Bullet Journal system provided the keys to create a system that worked for me, and that allowed constant change for my busy life. Having a system that I am able to customize so easily for whatever I need at the time has made sure I use it. I feel so much more on top of things, and I always know what I have done and what still needs to be done which has helped keep me focus and organized. I have been much more productive since I began using this system, and looking pack at prior weeks I can see my improvement. If you’re looking for a way to keep track of your busy life, I highly recommend giving this system a try. Like many women I love makeup, and lipstick is my absolute favorite. However, a quick google search on this particular product might make you want to kiss it good bye. The FDA does not regulate cosmetics, many lipsticks contain dangerous ingredients such as lead and heavy minerals, and by some accounts we swallow between three to seven POUNDS of lipstick in our life time (realistically it’s probably much less, but holy!). Luckily there are more and more natural and even organic products. But how well do these products work? I tested a few out and share my thoughts below. Key Claims: 8 hour wear, 100% natural, smooth satin finish. Packaging: Recyclable. Made of 100% #5 plastic and 60% PCR content. Featured Ingredients: Beeswax, Moringa Oil, Raspberry Seed Oil and Vitamin E.
EWG Skin Deep Rating: Not rated. The trial: This product has a light delightful smell and goes on smooth. I loved both of the colors I tried out, they were very natural, vivid and super long lasting. The packaging is interesting and unlike any I’ve seen before. I found my lips dried slightly with repeated wear, but I have the same reaction to Burt’s Bee lip balm; overall a great product. Color: 26 available. Tested: 401 Tempt. Key Claims: Industry’s healthiest lipstick, full coverage, cruelty free, made with wind power, no nano particles, no irradiation. Packaging: Blue and silver skinny tube. Inner and outer packaging recyclable. Featured ingredients: Castor seed oil, beeswax, Jojoba seed oil. The trial: This product has a light, pleasant smell and taste. The shape of the lipstick itself is squared, but is thin enough to apply smoothly. My lips felt great wearing this product and after. The shade I chose is the perfect my lips but better color for me. I was impressed that the color was true to the swatches on the website, it looks the same on as in the tube and lasts and lasts. I would definitely buy more of this product and would try more of the awesome colors. Color: 25 available. Tested: Margi and Liz. Key Claims: Vegan/Gluten free, cruelty free, moisturizing, antioxidant protection, vivid pigments and luscious flavors. Featured ingredients: Triiosterayl citrate, mooring oil, avocado and sunflower seed oils, coffee seed extract, blackberry and pomegranate extracts. EWG Skin Deep Rating: 3 (tested color not found but all available colors have this rating). The trial: Both of the products I tried had a pleasant fruity smell/taste, probably due to the blackberry and pomegranate extracts. The colors were both bright (much more so than they looked online) but were long lasting and had a great feel. Key Claims: German personal care product, many certified organically grown ingredients, eaves out the synthetic preservatives, colors, and petrochemical derivatives, no animal testing, deliciously silky and soft texture. The trial: While this product had a slightly mineral smell, it didn’t have an off-putting taste. I really liked how this product went on, and the color was super wearable with a shiny finish. The trial: While this is a lip conditioner not a lipstick, I wanted to include it in the trial as it is highly pigmented and this color is fairly well known. I really liked the sheer color and it feels delightful on the lips both while wearing it and it leaves your lips soft and comfortable, though the mineral smell/taste did bother me a little bit. The Bottom Line: There are lots of great natural lipsticks out there, and the few I tried hold up against mainstream lipsticks I’ve used. If I had to choose, I think the Vapor Organic Beauty Siren Lipstick was my favorite but I liked all of them. While it should be noted that natural lipsticks are not perfect and some still contain ingredients that may cause concern, they may be a safer option. When choosing a lipstick whether mainstream or natural check the ingredients, make use of tools like the EWG Skin Deep Data Base and like anything please use in moderation. The new year has arrived, a wonderful time of year that provides us with an opportunity for change and growth. In this spirit many people chose to make resolutions for the new year ahead. A resolution I hear often is to begin a regular yoga practice. This is an excellent goal with many rewards, but where do you begin to make such a practice successful? Here are a few suggestions to help you help you succeed. Set realistic goals. Be honest with yourself about how much time you have to dedicate to your practice, where you are at with your practice now, and what your goals are for a regular practice. Having realistic expectations will help make a regular practice sustainable and enjoyable. Make the time. Few of us have extra time or schedules that never change. Try to find a time that you are likely to be able to and will want to practice. For instance, if you are not a morning person is it reasonable to believe you will get up an hour earlier every morning for your practice? Be flexible. If you typically practice in the morning and you miss your practice, can you find another time to work in your practice that day? If you don’t have 60 minutes, can you find 10? If you’re not feeling up to a full practice can you do some sun salutations or maybe just rest in savasana? Being adaptable will keep your practice on track. Everything in moderation. When you begin your practice start out slowly. If you practice for 90 minutes and are sore the next day it will be hard to motivate yourself to keep practicing. As active as you are, remember that you also need rest. Some days you will be too sick to practice or something will intervene, and that is okay; the best part of a regular practice is that it will be there for you to return to. Keep it fun! Routines can become pretty, well, routine. To help keep yourself motivated be sure to change up your practice by trying new poses, practicing to a new playlist, practicing along with a new video by your favorite teacher, or treating yourself to a new mat or yoga pants. Rejoice in all your successes, not matter how small, and do not be derailed by set backs. Most of all, always remember it was love of yoga that created your desire for a regular practice and never lose that joy. 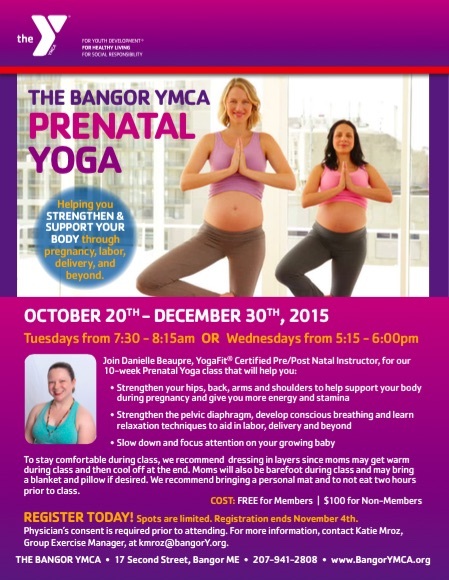 Prenatal Yoga Coming to the Bangor Y! I am ecstatic to share with you that I will be offering a 10-week prenatal yoga series at the Bangor YMCA from October 20th-December 30th! You can choose from Tuesdays 7:30 -8:15 a.m. or Wednesdays 5:15-6:00 p.m. This series is free for member and only $100 for non-members. Physician’s consent and registration required. Please contact the Bangor Y to sign up, and feel free to contact me with questions. At the Common Ground Fair last weekend I discovered Rooted Earth Farm, a two person sustainable farm in Casco, Maine. Amongst a variety of lovely, natural body care products I found yoga mat spray. If you have read my previous posts or taken a class with me you know seriously I take good mat hygiene and love a good natural product, so you can guess how excited I was to try it! The spray comes in three scents: Awake, Liquid Sunshine and Zen, and multiple sizes. I chose a 2 oz bottle of Liquid Sunshine, the lemon and lavender blend, and it did not disappoint. It is bottled in a beautiful cobalt blue glass bottle with a spray top. At first I was a little concerned about the bottle breaking, but it is quite durable and I have been toting it around to all of my classes with no breakage or leaking. I have eczema that is triggered by chemicals, so I absolutely love that the spray has 4 simple ingredients: water, witch hazel, lavender essential oil and lemon essential oil, so it doesn’t irritate my skin. I’ve used it on a variety of mats from PVC studio mats to my Manduka Pro without any fading, drying or residue. But don’t let the gentleness of this product fool you, with the power of witch hazel and real lemon and lavender it packs a real cleaning punch (just look at the paper towel when you’re done for proof). Another one of this products great features is its ease of use. There is no mixing, wetting a paper towel and spraying a certain number of sprays of product or waiting, simply spray and wipe. However, I’ve saved my very favorite thing about this product for last: the smell! The combination of lemon and lavender is pure joy. Whether you prefer to clean your mat before or after your practice, the delightful scent lingers helping you to find your calm and focus. I full-heartedly recommend this product to any yogi. This company really stands behind this product, too. When I had a problem with the spray top on my bottle (it turns out I had an old model top) I contacted the owner and within minutes I had response back and a new spray top in the mail the next day- now that is customer service. If you are looking for a ready-to-use, locally made, natural product to clean your mat that you can feel good about, give this spray a try.